I wrote a post a while back comparing my blood sugar response to protein compared to a non-diabetic friend’s response (Blood Sugar Responses Compared). In that n=2 study I noted that my blood sugar goes up a bit when I consume protein but my non-diabetic associate’s blood sugar goes down. Turns out this difference has been well known for nearly a century. A while back I reviewed a paper by Conn from 1936 (Protein vs Carbs). That paper (J Clin Invest. 1936 Nov; 15(6): 665–671. 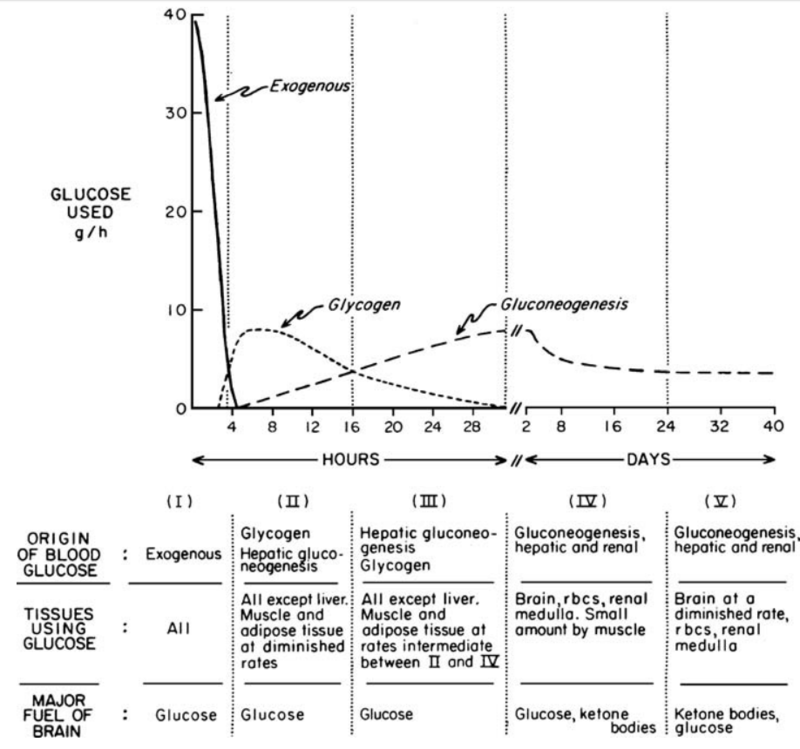 THE GLYCEMIC RESPONSE TO ISOGLUCOGENIC QUANTITIES OF PROTEIN AND CARBOHYDRATE. Jerome W. Conn and L. H. Newburgh.) which compared the blood sugar response of two non-diabetics against fifteen diabetics. Turns out there was a difference between the diabetics and the non-diabetics which matched my own n=2 results. Here’s the blood sugar response of the non-diabetics. And here’s the blood sugar response of the diabetics. 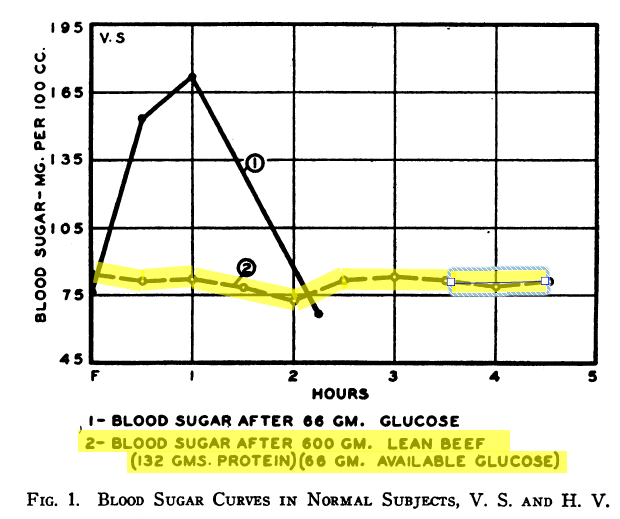 The blood sugar of the non-diabetics dropped when lean beef was eaten. 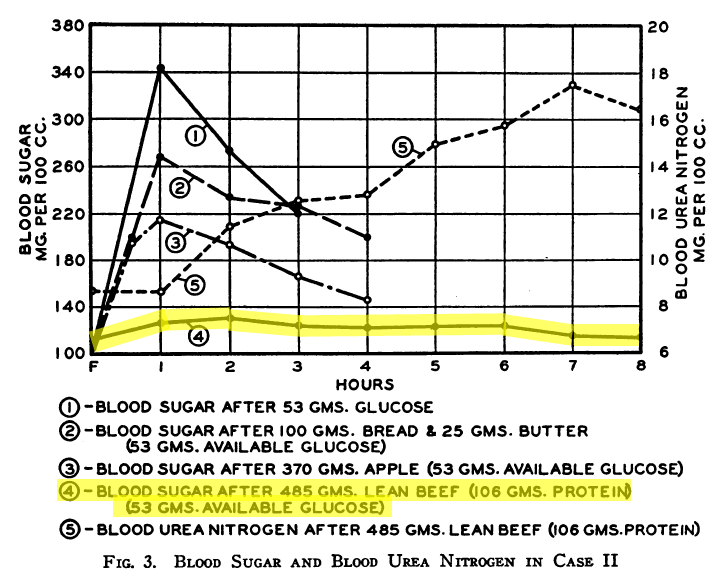 The blood sugar of the diabetics went up a small amount when lean beef was eaten. Could this be an interesting screening test for diabetics? The OGTT (Oral Glucose Tolerance Test) is one way to determine if someone is a diabetic. They are given a large glucose drink and their blood sugar is monitored over the next couple of hours. The peak value of the diabetic above is 340 mg/dl. The peak value of the non-diabetic is around half of that at about 170 mg/dl. Clearly there’s a difference there between the diabetic and the non-diabetic. A second difference is the time that the blood sugar takes to return to normal. In the non-diabetic they are back to their baseline at about 2 hours. The diabetic is still high four hours later. Either way, as long as I continue to have this blood sugar response to protein I still have at least one of the side-effects of diabetes. An interesting study on macros ratios which compared high carbohydrates to high protein impacts (Layman DK, Boileau RA, Erickson DJ, Painter JE, Shiue H, Sather C, Christou DD. A reduced ratio of dietary carbohydrate to protein improves body composition and blood lipid profiles during weight loss in adult women. J Nutr. 2003 Feb;133(2):411-7.). This study examined the efficacy of two weight loss diets with modified CHO/protein ratios to change body composition and blood lipids in adult women. Women (n = 24; 45 to 56 y old) with body mass indices >26 kg/m(2) were assigned to either a CHO Group consuming a diet with a CHO/protein ratio of 3.5 (68 g protein/d) or a Protein Group with a ratio of 1.4 (125 g protein/d). Diets were isoenergetic, providing 7100 kJ/d, and similar amounts of fat ( approximately 50 g/d). After consuming the diets for 10 wk, the CHO Group lost 6.96 +/- 1.36 kg body weight and the Protein Group lost 7.53 +/- 1.44 kg. Weight loss in the Protein Group was partitioned to a significantly higher loss of fat/lean (6.3 +/- 1.2 g/g) compared with the CHO Group (3.8 +/- 0.9). Both groups had significant reductions in serum cholesterol ( approximately 10%), whereas the Protein Group also had significant reductions in triacylglycerols (TAG) (21%) and the ratio of TAG/HDL cholesterol (23%). Women in the CHO Group had higher insulin responses to meals and postprandial hypoglycemia, whereas women in the Protein Group reported greater satiety. This study demonstrates that increasing the proportion of protein to carbohydrate in the diet of adult women has positive effects on body composition, blood lipids, glucose homeostasis and satiety during weight loss. The high carbohydrate group lost 7 kg of weight but about half of the loss was lean body mass. The high protein group maintained most of their lean body mass. The ADA 2018 Standards of Care for Diabetics are out. …further lowering of A1C from 7% to 6% [53 mmol/mol to 42 mmol/mol] is associated with further reduction in the risk of microvascular complications, although the absolute risk reductions become much smaller. Given the substantially increased risk of hypoglycemia … with polypharmacy in type 2 diabetes, the risks of lower glycemic targets outweigh the potential benefits on microvascular complications. polypharmacy = more than one medication at the same time. The medications that they give you run a risk of dropping your blood sugar too low which is even worse than being too high. That’s just plainly false or deliberately misstated. It may be the case that to solve diabetes requires 20 grams of carbs in one person but another person can tolerate 100 grams of carbs. This is where it gets really stupid. Monitoring something does absolutely nothing at all to state how much someone should be taking. Monitoring isn’t the answer except to determine how much carbs should be limited. Here’s the right way to state this. Monitor carbohydrate intake using glucometer. Don’t eat foods (type or quantity) which cause your blood sugar to go up more than 10 points over 2 hours. Test all your food intake and discontinue any carbohydrate sources which cause your blood sugar to raise. Now that would be useful advice. Could it be clearer than this? My HbA1C went from 8 to 5.2 after a year and a half of Low Carb. That’s pretty darned clear, right? While some studies have shown modest benefits of very low–carbohydrate or ketogenic diets (less than 50-g carbohydrate per day) (78,79), this approach may only be appropriate for short-term implementation (up to 3–4 months) if desired by the patient, as there is little long-term research citing benefits or harm. Let’s see. There’s evidence that Low Carb diets reverse diabetes. And diabetes is really bad for you. And they claim there’s no evidence of the long term benefits or harm from Low Carb diets. This begs the question – is there evidence of the damage from the alternate? Clearly, diabetes harms people long term, right? And the definition of low carb or keto as less than 50 g of carbohydrates flies in the face of the broadly agreed on number of 20 of carbohydrates being at ketogenic levels. Here’s where the insanity reaches a peak. Most individuals with diabetes report a moderate intake of carbohydrate (44–46% of total calories) (51). Efforts to modify habitual eating patterns are often unsuccessful in the long term; people generally go back to their usual macronutrient distribution (51). Thus, the recommended approach is to individualize meal plans to meet caloric goals with a macronutrient distribution that is more consistent with the individual’s usual intake to increase the likelihood for long-term maintenance. The logic is people like to eat carbs and will return to them. They lack self control so why bother telling them that low carb can be the cure for diabetes but they need to stay on the Low Carb diet FOREVER? What’s the alternative for diabetics? How about showing the patients pictures of amputated body parts? How about taking them to a blind school where many of the patients are blind from diabetes? Why not tell them about diabetic neuropathy and the constant pins and needles that people have? No, it’s better to give them a pill and send them out the door. Better not tell them that most of them will end up on Insulin. Why not tell them what can happen with a Low Carb diet? Most people would love to lose weight and maybe even get below their High School Senior year weight, wouldn’t they? Why is there ZERO support in place for people who really want to do this with Low Carb? Why are all of us on our own and being told that we shouldn’t even bother since we will fail anyway? If people did just those things then things would be better. But how good have people shown themselves to be at reducing refined carbohydrates? Why not just say that they need to ELIMINATE refined carbohydrates entirely? Then we can forget about compliance in reducing. Why not teach people that over dependence on Insulin will result in Insulin Resistance and ever increasing dosage needs? Why not tell people that their ability to control their blood sugars will get worse and worse with time on Insulin? Why not tell people that every day they have high blood sugar numbers their own pancreas is dying (beta cell death) and that at some point in time they may not be able to get off Insulin ever? I need to stop now. This is upsetting me. They really don’t care about diabetics. If they did they would tell them the truth and try to get them cured. Trying Branched Chain Amino Acids (BCAAs) for pre-workout performance boost. 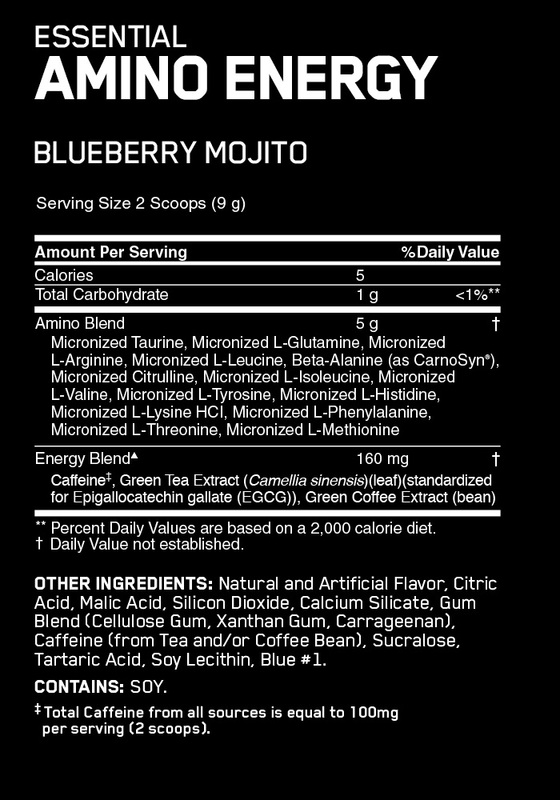 Product is fortified with 100 mg of caffeine so it may be interesting (a little over 1 cup of coffee worth). I normally drink a fair amount of coffee but mostly a 80% decaf/20% caffeine mix. 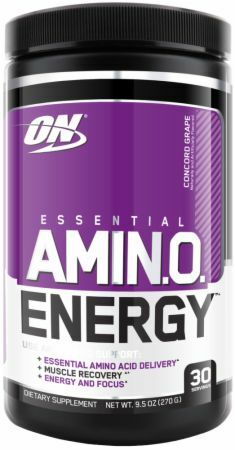 Product I am trying is Optimized Nutrition “ON” Amino Energy. Two scoops are 5g of Amino Acids.